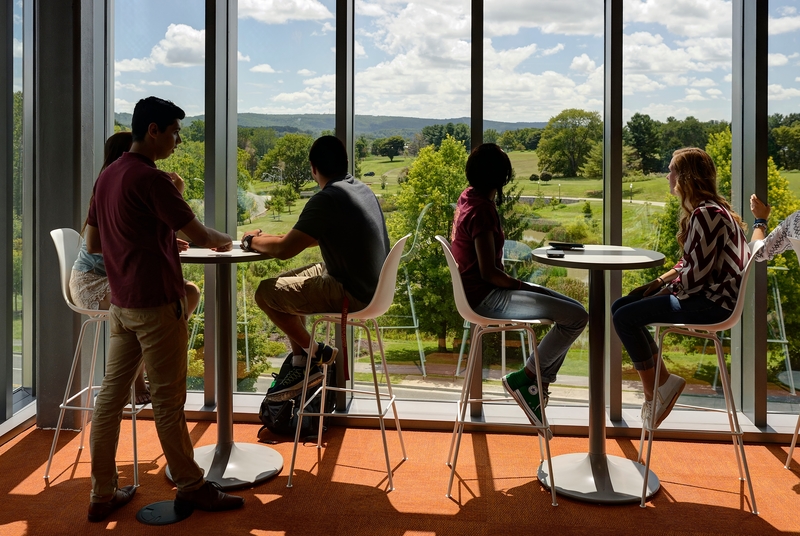 The New Classroom Building at Virginia Tech is a new state-of-the-art classroom facility that meets the need for flexible classroom spaces in a multi-disciplinary educational environment. We were excited to see Virginia Tech’s commitment and vision to shift pedagogies and influence the future of learning. In our discussions with Virginia Tech, we found that furniture adjustability within the classroom spaces was crucial to achieving this goal. The New Classroom Building houses 13 flexible classroom spaces, four teaching labs, and two SCALE-UP (Student Centered Active Learning Environments for Undergraduate Programs) classrooms. 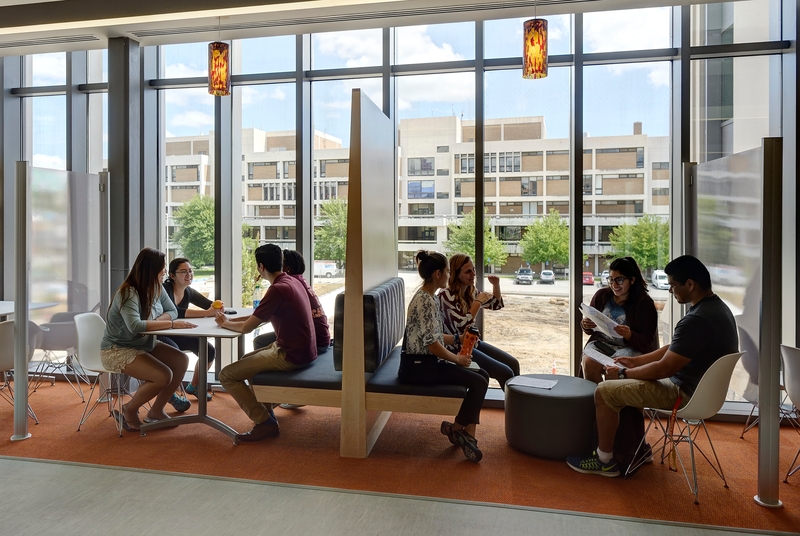 The goal of SCALE-UP configurations is to create active learning spaces for teams of three groups of three students per table to work and collaborate together. 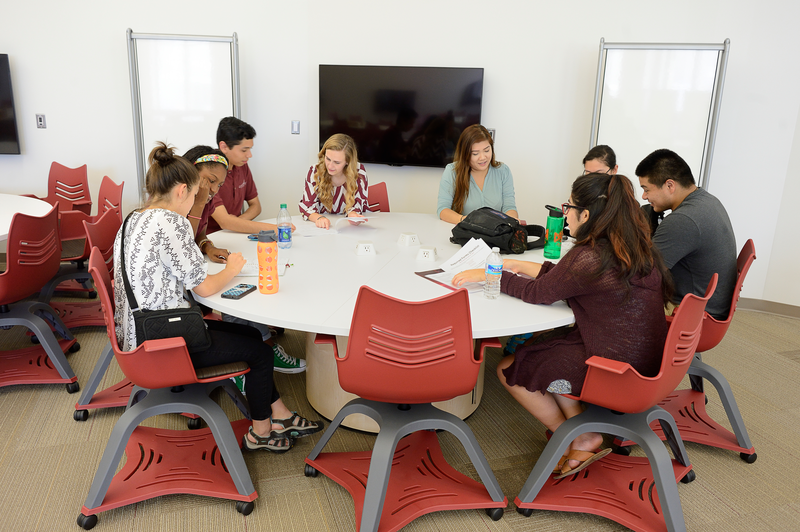 For the SCALE-UP tables, KSA worked closely with AB&D Furniture Manufacturing to develop a customized solution to meet the needs of Virginia Tech, providing charging stations on the work surface and a drum base for wire management. The drum base also allows for uninhibited movement around the table, for easy clustering as needed for group work. 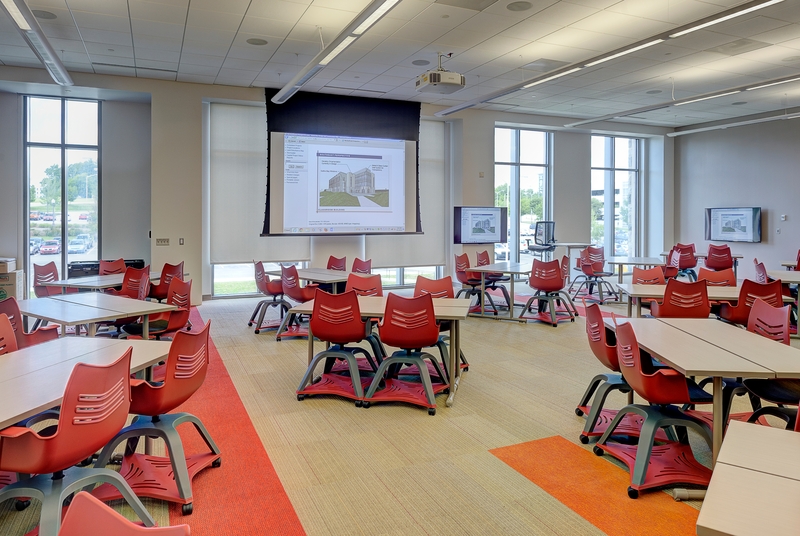 For the 13 flexible classrooms, the selected furniture can easily facilitate group breakout work, lecture-style rows, and horseshoe-style discussion settings all using the same parts and pieces. We also worked closely with National Furniture on the Essay student chairs to develop a custom shell color that complimented the branded interior finishes. The building also has many breakout spaces for informal meetings among students and faculty This required furniture arrangements to support a variety of postures.. Counter-height and bar-height seating areas allow for device charging and quick collaboration, group work tables and seating are located at built-in booths designed by the architects, and soft-seating areas with pull-up laptop tables provide areas for individual and small group work. The Virginia Tech brand is prevalent throughout the interior finishes. Because of this, we chose neutral furniture finishes for the lounge areas to compliment the brand in a thoughtful yet controlled way. With a diverse furniture landscape, we made it a priority to create cohesion among the different spaces. We accomplished this by utilizing similar families of furniture in a limited number of finishes to help emphasize the brand as well as showcase the great views from the large windows. What is most exciting about this project is watching how students utilize the finished spaces. Our goal when designing is always based around the end-user experience, and it has been great seeing how the students are utilizing the space.